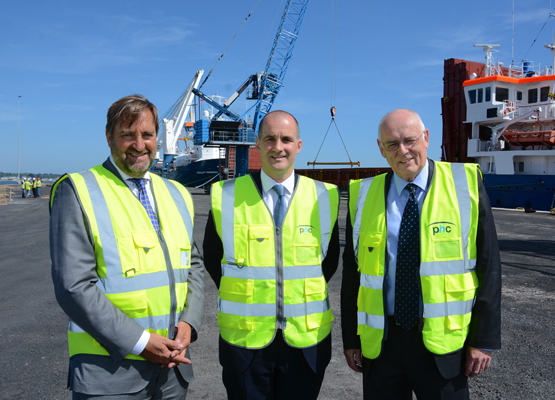 South Quay in Poole Port has been officially opened by Government Minister, Jake Berry Parliamentary Under-secretary of State for Local Growth. The Minister was welcomed by Jim Stewart, CEO of Poole Harbour Commissioners and Chairman of the Dorset LEP who took great pride in showing the minister around the newly expanded South Quay. Completion of the £10m South Quay project concludes Poole Harbour Commissioner’s ambitious 7-year expansion, said to be one of the biggest port developments seen on the South Coast in recent years. South Quay is a 200m long x 40m wide deep-water quay that provides 9m in depth to accommodate vessels up to 220m in length. This has seen the Port’s capacity for conventional cargoes, yacht liners and special project cargo increase and will facilitate the ever-increasing interest from cruise ships wishing to visit Poole and the surrounding area. The development has enabled the port to accommodate bigger ships, carrying over 1,000 passengers. South Quay has been operational for cargoes and yacht transfers since the beginning of the year, but the completion of the surfacing work allowed Poole to welcome its first Cruise Ship of the season in the first week of May; The Corinthian, operated by Grand Circle Line Cruises.